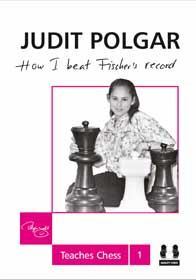 …was the new and absolutely delightful Judit Polgar: How I Beat Fischer’s Record. The publishing house, Quality Chess, have come up with, well, yet another quality chess book. The volume (the first of three) reads as an instructional manual, with a number of personal annotations and helpful and not-overwhelming analysis. Some of her complete games are annotated towards the end, all up to and including the tender age of 15 years and a few months, when she became a Grandmaster (beating Bobby Fischer’s record by about a month). I can read through this without a chess board and play through most of the very enjoyable analysis in my mind, as there are lots of great diagrams so you don’t get lost. Judit doesn’t carry the ego that many male chess players do, so her comments are a true breath of fresh air – she is free to praise her chess rivals, for example - yet her brilliance is every bit as dazzling as the best male players, and she is clearly also an energetic and inspiring teacher. Ryan Jones produces some terrific material on his blog, here. Today he posted an insightful review of Goheen's and Bartholomew's The Drama of Scripture. Check it out, here. “Nothing can be asserted theologically that cannot also be experienced”? One line I heard during the Colin Gunton Day at King’s College London, today, was: “Nothing can be asserted theologically that cannot also be experienced”. The speaker was not entirely endorsing this, and was using this as part of a launchpad into an interesting paper about Schleiermacher. But it made me slow down and ponder. Although I think that this sentiment contains a germ of truth, I cannot agree (it is locked into a dated and problematic epistemology). What do you think? On a different note, one very good paper discussed Augustine and Kant on sin, its origin etc. and while I am grateful to remain a member of the New Testament guild, I find it amazing that some would think that these kind of matters are anything but potentially very enlightening for our own work. This one, for example, took me right back to Romans 5:12 with a keen sensitivity to conceptually related matters of some significance. Very excited by this book – just arrived in the post today, and my reconnaissance mission into the book alerts me to the fact that there is so much here for me to ponder. One of the things that has struck me afresh recently: what we biblical scholars say, how we interpret the bible, has potential ramifications for the way people live an relate to one another in both the macro and micro levels. We have responsibilities. For us to say that we are “simply doing history” is, although it contains a vital and important element, also – if it remains locked there – a tragic cop out. Quite a bit can be read online, here. On a related subject, I am also looking forward to learning much from my colleague, Stephen Backhouse’s book, Kierkegaard’s Critique of Christian Nationalism. Check out the Google preview, here. Okay one and all, the Duke Uni Campbell conference is now up. I will be presenting a couple of papers, and respondents include Stephen Chapman, Susan Eastman, Stanley Hauerwas, Willie Jennings, Warren Smith, and David Steinmetz. Very exciting! Tremendously glad that Jim West is also coming, so if we are not in the library, I plan to urge that we spend as much time as possible in the local – and awesome - Bojangles' Chicken restaurant! Summary and discussion of “Rereading Paul’s Dikaio - Language,” Douglas Campbell. Thus, there were two systems of vocabulary in antiquity, and when translating from Jewish to pagan thought-concepts, Jesus would have been understood as a god from the beginning–just not the God, a hugely important distinction, even for pagans. Christians would not consider Jesus to be the God until well into the second century (at the earliest); but they already considered him a god from its earliest recorded time, if we use pagan but not Jewish vernacular. For example, Paul slips into pagan vernacular when he calls Satan a god (2 Corinthians 4:4); obviously if Satan could be called a god, so could Jesus, who was his celestial superior. For what it is worth, I think that Carrier’s argument crashes immediately and i) mistakes Paul’s divine-Christology with the use of the word theos, and ii) fails to recognise the structure of Paul’s Christ-language which patterns the same in terms of Israel-YHWH-relation language. On the other hand, if I understand McGrath correctly, I believe he too mistakenly thinks a Pauline divine-Christology is engendered by religious bias rather than serious historical and exegetical work. I tend to think almost the opposite can be true, namely that non-divine christological construals of Pauline theology demonstrate strong ideological motivation, usually bound to the legitimisation of critiques of theologically conservative paradigms (and I say this as one sympathetic to such critical concerns, but they often lead to the obscurification of Pauline theology at this point). While on the matter, Géza Vermes’ new book, Christian Beginnings, has – let’s not beat around the bush - an absolutely terrible section in chapter 4, “The Status of Christ in the Pauline Religion”. It doesn’t engage with crucial scholarship, and trots out fallacy and imprecision. The rest of his book might be wonderful, I didn’t read any further! Read the rest here. Very encouraging! My sincere thanks to Scott for these kind words about my book. I miss our days together in Tübingen! Did Paul teach that Jesus was divine, and to be worshipped as such? How should this be viewed in relation to Jewish—and Jewish Christian—monotheism? The debate over these and related questions is raging in academic circles, but also has profound implications for church practice. It is a joy and a challenge to read such a clearly written and convincingly argued treatise as Chris Tilling's Paul’s Divine Christology. Dr. Tilling enters the discussion of Pauline Christology with a fresh pair of theological eyes, and—perhaps more important—with a heart for the church. Paul's Christology is relational—he uses the language of YHWH's relationship to Israel to describe the Christians' relationship to the risen Lord. The Christ-relation was Paul's way of expressing a divine Christology. This conclusion has implications for understanding Paul's theology from his Damascus Road theophany and conversion onwards, and thus addresses the current debate about whether and how one can describe a "theology of Paul." Moreover, addressing modern Christology's version of Lessing's "broad, ugly ditch" between exegesis and systematic theology, as well as that between the Jesus of history and the Christ of faith, Dr. Tilling engages in dialogue with the major international participants in this discussion with a sympathetic yet critical eye towards a new approach which transcends the old impasses. His handling of methodology already points a way forward. Building on the work of such scholars as Hurtado and Bauckham, he credits their thinking for advancing the discussion, while astutely identifying the weaknesses or limitations of their arguments. The conclusion, that Paul's relational Christology is Divine Christology, spans the "ditch" and promises to help transcend the distance between exegesis and systematic theology, and between academy and church. This book is an important contribution to the debate over Christology, and will take its place in the history of the discussion as a milestone publication which moves the discipline forward into the 21st century. A "Must-Read" for anyone interested in Pauline theology and exegesis, as well as those engaged in the current debates over Christology. My thanks to friends at Wipf&Stock for a copy of the new edition of P&R’s Introduction. Part and parcel of life as a lecturer and biblical scholar is a regular diet of introductions to the New Testament. Generally speaking, the different offerings all have something going for them. The Moo&Carson volume does a brilliant job at summarising different scholarship and engaging with the text. There is, however, a strong and to my mind not always helpful ideological closure in sections, and so it needs to be supplemented by others that may be weaker in other areas, but theologically broader. And so on. So how does P&R's contribution fair, and what have they added in the second edition (the first was published in 1989)? It is easy to answer the second part of that question. Largely in response to the comments of reviewers and a general development in scholarship, more than 30% of the material of the 1989 edition has been revised. In other words, you have a book that is largely up-to-date on most areas. The book is divided into three parts (part one: the world of the new Testament, part two: interpreting the new Testament, and part three: Jesus in early Christianity). There are then two appendices on the formation of the New Testament canon and English translations of the NT. In other words, the book introduces us to the staple fare of information that you would expect from any usual introduction. A closer look, however, reveals a useful and concise overview of the Greco-Roman and Jewish context, and the language and text of the New Testament. This is accompanied with a number of diagrams, tables and pictures. The chapter on the language of the New Testament offers much material that you won't find so readily in other New Testament introduction, and the same could be said about the chapter on the text of the NT. The part dealing with the interpretation of the New Testament again presents the usual diet, and does so very cogently and clearly, always well structured, subtitled and signposted. It also needs to be said that everything I have read thus far is decently researched and engages with most important secondary literature (though of course one can always find omissions in such books!). In this section, however, one dealing with the interpretation of the New Testament, I would have appreciated greater breadth of presentation, including the kind of hermeneutical approaches spelt out with particular clarity in DeSilva's introduction. Particularly helpful, I thought, with chapters dealing with the emerging Christian orthodoxy. This is the kind of material that you would tend to find elsewhere, perhaps on a different course. But it remains true that docetism, realised eschatology, Polycarp and so on are relevant to matters of new Testament interpretation. So bravo for these chapters! I would instead point students to Schnelle’s work to introduce students to Pauline chronology, though their overview is a good primer, and I would strongly urge that further editions take Pauline theology more seriously. This was a big lacuna. Furthermore, I remain unpersuaded that their chapter “The major Phases of Early Christianity” accurately explains the development of the earliest Christology. The book is strongest on background issues, traditional historical-critical methods, the historical Jesus and the “emergence of Christian orthodoxy” themes noted above. In sum, this was a readable, informative, concise and fairly affordable introduction to the new Testament. I would not use it as a stand-alone text for my introduction to the New Testament course, and would prefer to supplement it with perhaps DeSilva's introduction and Moo&Carson’s (I will probably urgently recommend Schnelle’s introduction, once I have had a chance to check the English translation) . A final word: if your New Testament introduction courses work through individual texts of the NT, you may be disappointed as this introduction does not seek to give an overview of all of individual texts. Rather, it focused remains much more on questions of historical context, and historical critical issues. But it does this and reliable and readable manner.